The Yogācāra system is presenting us with 8 vijñāna’s, evolving from one basic form of consciousness, which is the ālayavijñāna. A common translation of vijñāna in the context of Yogācāra Buddhism would be “consciousness”, however, the concept of vijñāna as part of the epistemology of Yogācāra Buddhism, is a specific type of consciousness, a faculty of the mind, which is the counterpart of a specific source of knowledge. The basic principles of this epistemology are comparable to the Saṃkhya philosophy, where every organ of perception has its counterpart in a specific faculty of the mind. The Pravṛttivijñāna is a collective name for all the particular Vijñānas that evolve out of Ālaya, when they are considered from the point of view of evolution, while the Ālaya is the Vijñāna or Citta that remains undisturbed in its native abode. […] there is no cessation [of Ālaya] in its original form. Therefore, Mahāmati, what ceases to function is not the Ālaya in its original self-form, but is the effect-producing form of the Vijñānas. […] If, however, there is the cessation of the Ālayavijñāna [in its original form], this doctrine will in no wise differ from the nihilistic doctrine of the philosophers. 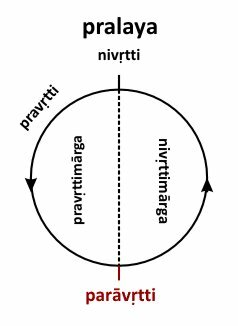 […] and there is no cessation in its aspect of self-origination (svajāti). That which ceases, Mahāmati, is not the aspect of self-origination, but it is the aspect of activity (karman) of the Vijñānas. What are the doctrines taught on this subject by the Esoteric “Buddhists”? With them “Alaya” has a double and even a triple meaning. BUT WHERE WAS THE DANGMA WHEN THE ALAYA OF THE UNIVERSE (Soul as the basis of all, Anima Mundi) WAS IN PARAMARTHA (a) (Absolute Being and Consciousness which are Absolute Non-Being and Unconsciousness) AND THE GREAT WHEEL WAS ANUPADAKA (b)? Alaya is literally the “Soul of the World” or Anima Mundi, the “Over-Soul” of Emerson, and according to esoteric teaching it changes periodically its nature. Alaya (Sk.) The Universal Soul (See Secret Doctrine Vol. I. pp. 47 et seq.). The name belongs to the Tibetan system of the contemplative Mahâyâna School. Identical with Âkâsa in its mystic sense, and with Mulâprâkriti, in its essence, as it is the basis or root of all things. Here we see that ālaya is identified with the First Logos (mūlaprakṛti) in its essence, “as it is the basis or root of all things” (Tibetan: kun gzhi). Alaya, the Universal Soul, of which the Manvantaric aspect is Mahat. […] Buddhi is a ray of the Universal Spiritual Soul (ALAYA).